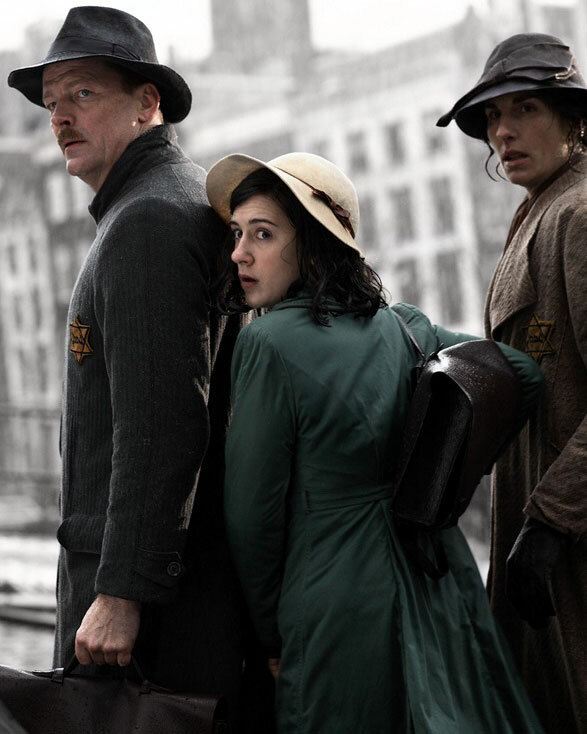 I was still wavering over whether or not to watch the BBC’s 2009 dramatisation of The Diary of Anne Frank, even as I was placing the DVD into the disc-tray. On the one hand, I’m keen to watch as much of Ellie Kendrick’s work as I can… on the other, I knew that the experience would be quite emotionally draining, and that the tragedy might hit even harder than usual, due to my lingering affection for the actress. Even so, I didn’t expect my eyes to start misting up quite as early as they did… somewhere around the one minute mark of the very first episode! I was even sniffling in-between episodes, whenever I thought ahead to how the story would inevitably end. That said, there’s also a lot of humour here… at times it almost plays like a sitcom, with the incompatible inhabitants of the annex sharing jokes, and overcoming minor domestic upsets… though the threat of discovery and the horrors that might (and indeed did) follow are never far from anyone’s mind. Although the Holocaust is a deadly serious subject, I think the reason why Frank’s writing is so effective at capturing and keeping the attention of readers around the world, is that it’s so lively and honest and earthy… an unfiltered, farts-and-all account of her real life, as opposed to more sober, academic, and overly-earnest second-hand treatments of the issues. As expected, Kendrick brought her innate adorability and cheery spirit to the role, but didn’t shy away from showing the stroppier, somewhat self-centered side of Anne. Of course, her more negative traits were exacerbated by the close quarters and gruelling circumstances, so it seems rather shabby to even mention them… but that’s actually the side of Anne that I always identified with, when I first read her diary… and it doesn’t detract from the fact that she was self-aware and observant enough to provide us with compassionate depictions of all the other occupants, no matter how much they frustrated her (and vice versa) during their enforced confinement. Nor does it negate her heartfelt (and possibly misplaced) belief that humankind was basically good and decent. The series surrounds Kendrick with a fantastic supporting cast, including Tamsin Greig in an unusually subdued and dramatic role as Anne’s underappreciated mother ‘Edith’, Felicity Jones as Anne’s (supposedly) favoured sister ‘Margot’, Lesley Sharp as Edith’s brassy opposite ‘Petronella van Daan’, and Kate Ashfield as courageous family friend ‘Miep Gies’. Fellow Game-of-Throner Iain Glen also deserves a nod for his performance as the ever-reliable, even-tempered patriarch ‘Otto Frank’ (his reaction to Anne’s declaration of independence was especially heart-breaking), and I can’t for the life of me understand how this production received so few award nominations and wins! Of course abridged adaptations are always going to be inferior to the original source material… especially in the case of historical memoirs, such as The Diary of a Young Girl… but I thought this was a pretty flawless, faithful, honourable, entertaining, and engaging evocation of Anne’s experiences in the annex. P.S. The DVD case contained a leaflet promoting The Anne Frank Trust (UK), a charitable organisation which “draws on the power of Anne Frank’s diary to challenge prejudice and reduce hatred, encouraging people to embrace positive attitudes, responsibility and respect for others”… so, yay for them. This entry was posted in Rants about Books, Rants about TV and tagged Anne Frank, Ellie Kendrick, Felicity Jones, Kate Ashfield, Lesley Sharp, Tamsin Greig, The Diary of a Young Girl, The Diary of Anne Frank. Bookmark the permalink.